Bubbly. Compassionate. Friendly. All words that Lubbock Christian University senior Allea Harris uses to describe herself. Words that one would find hard to discredit. However, her transition from off the court to on the court is a night and day difference. 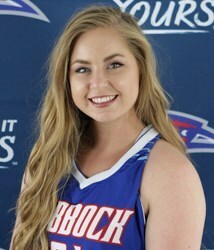 Once at LCU, Allea has enjoyed a significant role for the Lady Chaps. She was part of the historic 2015-2016 team that won the national championship, her most memorable moment as a Lady Chap. When asked what she has learned from her experiences so far, Harris said that Head Coach Steve Gomez has been influential on the court, as well as off. “Coach Gomez has made me a more solid player, but he also has shown the importance of leadership and setting a good example.” In 2016-2017, Allea has used her shooting prowess and court awareness to earn herself a more prominent role, a role that she hopes will bring the team the same success it enjoyed a year prior. Allea has multiple people she looks up to and admires, but one sticks out the most. “I look up to my dad because he is a hard worker in whatever he does to ensure that our family, and anyone around him, is taken care of.” Harris, a communication major, is using her father’s work ethic to pursue her dream career of being a field reporter for basketball upon graduation.